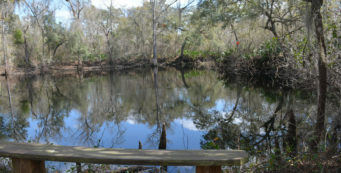 Florida Trail, Hopkins Prairie to Salt Springs | Florida Hikes! 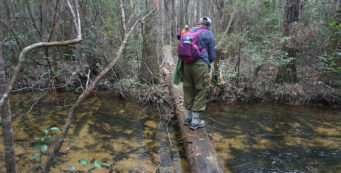 While the Ocala National Forest is best known for having the largest expanse of scrub forest in the world, a lesser known facet of the forest – unless you hike the Florida Trail – are its wide, open prairies fringed with scrub forest. Here, sandhill cranes gather in groups, kingfishers buzz above small ponds, and eagles soar over the open landscape. A blue-blazed high-water route goes around most of this segment, but is simply a roadwalk: better to stick to the trail if you can. North trailhead: Park at the Salt Springs Observation Trail trailhead off SR 19 just south of the town of Salt Springs. 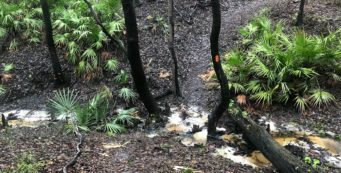 Cross the highway and hike north about a quarter mile to find the orange-blazed trail connector, clearly marked with a Florida Trail sign. Leaving the parking area, head straight into the woods in front of you. It’s a diminutive oak scrub, a delicate forest under a low canopy of sand live oaks with hanging gardens of lichen dripping from the branches. After a quarter mile, the trail makes a left turn to pass a sinkhole before crossing a forest road blocked off to vehicular traffic. Blueberry bushes line the footpath, reminding you that this is bear country. Don’t be surprised to see bear footprints in the sand. After heading down a long corridor in the scrub, the trail empties out on the edge of Hopkins Prairie at 0.4 mile. Turn right – to your left is the campground – to start following the trail around this very large prairie. After wandering along the prairie’s edge, in and out of hammocks and along the prairie shore, at 0.9 mile the trail meanders around a small pond, which in times of low water would still provide a water source. A short distance later, you have your last glimpse back towards the peninsula where the campground is located, as the trail dips into an arm of scrub forest and pops out onto a different shore of the prairie. 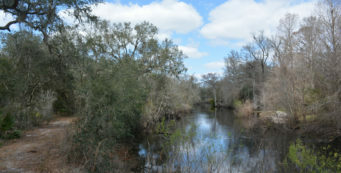 Rounding another prairie pond at 1.4 miles – with close access for water – the trail continues along the rim between sandy shoreline and saw palmetto thickets, passing another pond within a tenth of a mile. The walk along the prairie rim is an easy one, a gentle one, provided it’s not a wade. The sandy shore is obvious, and the trail tends to stick close to it, occasionally dipping in and out of the scrub forest. Blazes can be sporadic, so side trails may lead you off the mark. Just keep close to the prairie rim and you’ll be fine. After 2.5 miles, you’re walking beneath tall longleaf pines on the edge of the prairie, with smooth cordgrass jutting out along the prairie banks and willow trees in the distance. A high spot to your right might make a good campsite. Chirps arise from the grasses along a marsh on the prairie rim, three miles into the hike. 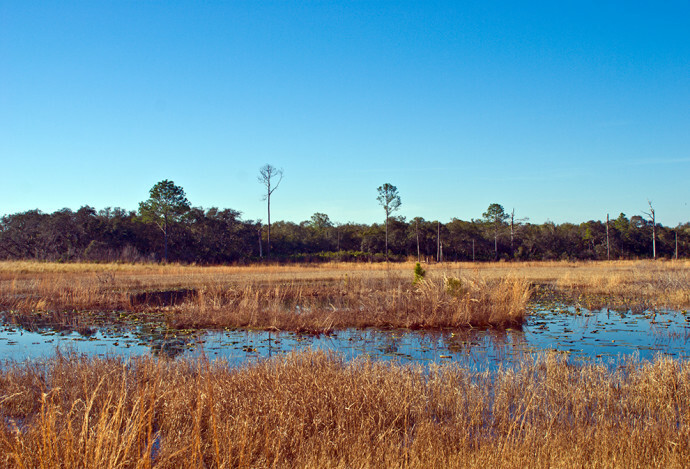 The marsh extends for some distance paralleling the trail, and is alive with the croaks of frogs. 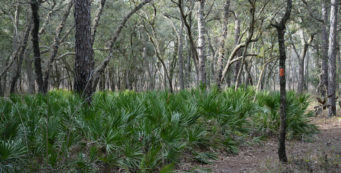 The trail ducks into some nice shade soon after before rounding another marsh that’s a symphony of textures among the layers of grass, which rise to a crescendo in the middle surrounding wax myrtles and loblolly bay trees. After 4.1 miles, the trail reaches the tip of the farthest arm of the prairie and starts to loop back on the other side – you can look across and see where you’ve been. A lot of the pines here are dead, their crumbled piles of bark attesting to the ravages of pine bark beetles. The sweep of view here goes on for one to two miles across the flat landscape. At 4.6 miles, you round a cove with a pond covered in water lilies, with islands between pond and prairie. This appears to be another permanent water source, and your last chance for water at the north end of the prairie. There is no more reliable surface water along the trail until Grassy Pond, 11.9 miles north, so if you’re backpacking, stop here to fill up. Next stop for water for backpackers is The 88 Store, 9.6 miles north. The trail continues its boomerang route, backtracking along this shoreline to find the entrance into the scrub forest, which it finds just a little ways farther along the shoreline. Heading uphill, the trail enters the long, green tunnel of scrub, emerging at FR 65 at 5 miles. The trail continues directly across the road. Look to your left and you’ll see a blue blaze – the end of the high-water route around Hopkins Prairie, which starts before this hike does, halfway between the Hopkins Prairie Trailhead and the Pat’s Island Trailhead. It’s rarely needed, but came into play after the hurricanes of 2004 when the prairie didn’t drain very quickly. The trunks of the pines around you are rather thick as the trail works its way through a mature sand pine forest. Crossing FR 90, you’re quickly back to the long green tunnel. Throughout the underbrush, eastern towhees hop and chirp to each other. Heading down an obvious downhill under tall, old sand pines with moss-covered branches, the trail slips into a transition zone of sandhill habitat with turkey oaks. 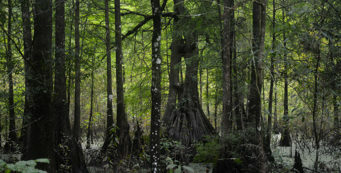 Dropping down out of a sand live oak hammock, the trail rounds a small prairie with a pond at its heart at 5.8 miles. Just past the pond, you emerge at what looks like the dead-end of an old forest road that provides a nice flat spot to pitch a tent. From here, the trail rises back into the scrub. Rounding another prairie hidden behind a screen of saw palmetto and ringed with tall longleaf pines, the trail continues past a string of small prairies, and rises up to meet the bench that marks the intersection of the Florida Trail and its blue-blazed side trail to Salt Springs, well marked by a sign. Here’s your decision point. Backpackers will likely continue north, unless they have a need for resupply in Salt Springs; day hikers will probably turn right to head out to SR 19 where their car is parked (or a shuttle available). Since I’ve hiked this blue-blaze each time I’ve hit this point in the trail, but only recorded the details once, it’s described as part of the Florida Trail, Salt Springs to 88 Store segment. It’s a 2.5-mile connector all on its own. Follow the blue blazes to Salt Springs – they’re well marked and not tough to follow, leading you around large prairie ponds and through stretches of scrub and sandhills. The trail emerges along the berm of US 19, where you may have parked. You’ve hiked 9 miles. Not parked here? It’s another half mile up the road to your right and across to the Salt Springs Observation Trailhead, which is a safer place to park a car (if backpacking) and home to the Salt Springs Loop.